A mentor takes a personal interest in and helps an inexperienced person, offering knowledge, insight, perspective or wisdom. Most new members are not familiar with your club. They don’t know what a timer is or what an Ah-Counter does. Yet new members are expected to participate and give speeches – something many are terrified of doing. Some clubs expect them to do all of this with a minimum of instruction and guidance. Some clubs have mentoring programmes which give new members a much better experience. Adding this to your club’s advantages is easy! 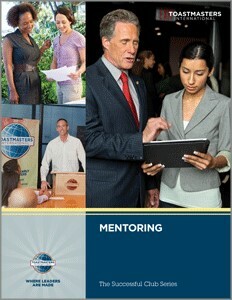 Conduct The Successful Club Series presentation titled Mentoring and teach your club what it takes to become a mentor. You can also find an excellent article Five Tips for Mentors here.